The "flying saucer" captivated the U.K. press in 1957. Pieces of a 50-year-old English "flying saucer" have turned up in the London Science Museum archive. As the BBC reported Feb. 9, David Clarke, a journalism lecturer at Sheffield Hallam University, examined the metal shards and determined that they came from a famous 18-inch (45 centimeters) metal saucer. The object captivated the U.K. press in 1957 after it turned up in Silpho Moor near Scarborough, Yorkshire, England. Then, after being chopped up into bits for examination, it gradually disappeared in the intervening decades.. 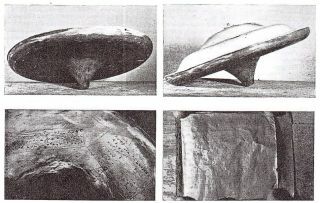 The Silpho Moor saucer also contained a small book, the Post reported, covered in more hieroglyphics, which a Scarborough café owner claimed to decipher as a warning from an alien named Ullo about atomic war: "You will improve or disappear." Metallurgists and other experts who studied the Silpho Moor object determined that it had no special properties and had never been to outer space, the Post reported, a journey that leaves telltale signatures in metal. Still, now that Science Museum archivists have learned the "cultural significance" of the rediscovered shards, the BBC reported, they might put them on display as a record of that strange moment in British history.